Originally, I was going to just write a blog post about my experience with Fitbit Flex and Nike Fuelband (first generation), but then I ran into some issues with the Flex that made me curious about Garmin’s Vivofit so I purchased the item to try it out as well. 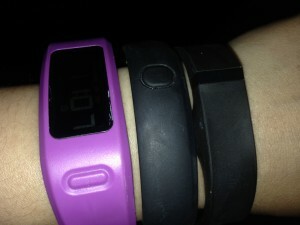 For the past month and a half I have been wearing three fitness trackers on my arms I have the Fitbit Flex, Nike Fuelband (SE) , and the Garmin Vivofit on to test drive them together. I have gotten a lot of questions as to why I do this, and the simply answer is because I am geek with a blog. Everyone else has already seen reviews of the first hands-on, but I wanted to write about my experience as a user with a longer time span in mind. Now I finally feel like I have enough information to write a good post about my field test with the three fitness monitors. I have been a fan of Fitbit’s for a long time. I started with Fitbit’s Ultra, which clips to your clothes (which they no longer make) and I have been wearing the Fitbit Flex since last year. When it comes to the API and the number of apps that their fitness monitor works with, there is simply no one who does it better. At current count there are 37 apps listed in Fitbit’s app gallery and it is by far the most popular fitness monitor out there in terms of market share. Chances are, you know someone else who also wears a Fitbit. According to a Forbes article from February this year, “NPD now says Fitbit has 77% of the market for full-body activity trackers despite potent competition from Jawbone, Nike’s Fuelband, and others… as well as 50% market share for digital fitness devices such as those made by Garmin and others.” This is an incredible accomplishment for a company that launched its first product in December 2009! However, I have had several problems with my Fitbit Flex, the least serious is the placement and how the tracker fits in the band; the most serious one revolving around its battery. The band can get a bit stinky since water can get inside the pocket where the tracker resides. This is remedied by regularly cleaning the pocket with some alcohol while the tracker is charging. The more serious problem is the battery — either it dies and will not longer hold a charge, or it simply doesn’t hold a charge for very long. As of this writing I am wearing my 3rd Flex since I purchased the Flex on September 2, 2013. The first one dies within the first month, where it would not hold a charge. The second one died on me near end of April (when I decided to start looking into the Garmin Vivofit), and the company sent out another replacement. Even now I have had to charge my Fitbit almost every 36-48 hours (even though it is supposed to hold a charge for about 5 days) because it keeps telling me that its battery is low. Sometimes it does respond to a few tricks I have learned (like resetting it). I find that this is annoying as it take about 3 hours for a full charge and sometimes once I take it off to charge it, I would get busy (as things tend to get with two young toddler in the house) and forget to put it back on, which means I might not be getting that data for half a day. I didn’t have this kind of an issue previously with Fitbit’s Ultra, which had a problematic clip instead. Fitbit’s customer service folks are nice, though they are only available via their forum and email, so it take a while of back and forth to get things resolved. They are nice enough to replace my Fitbit each time but I can’t help but feel like maybe I am spending too much time dealing with their customer service for my liking. Fitbit likes to follow its procedures and make sure you already jump through a few troubleshooting hoops and that’s alright for the novice user who doesn’t read their help docs and forums, but for someone who’s done their homework, it can feel a bit punishing. Having spent enough time on the Fitbit forum, I have come to realize that my issue is actually quite common, and I am really hoping that Fitbit will continue to work on their hardware quality issues. Now that I have griped about the hardware problems, I will say that the software and web interface is very good. I really like the Fitbit app on the phone (it takes up 13.9MB+ on my phone as opposed to the 46.9MB+ for the Nike Fuelband). Fitbit shows a lot of good data, tracks your sleep, and displays everything well on the phone and on their web dashboard. I don’t really use their app to track food as I use MyFitnessPal for that and it syncs with MyFitnessPal nicely. Fitbit is sold at a lot of placed, but if you decide to buy a Fitbit, it is still best to do it through Fitbit.com directly because their return policy is much better than anyone else’s (45 days money back guarantee). Nike’s Fuelband has really good solid quality feel to it. It has a wonderful clasp that never comes loose and the product feels well-made compared to the other plastic bands. The only danger with this band is that when you close it you might snip your skin! This is the only band that has not has the clasp accidentally come apart, ever. The Fuelband displays time, calories, steps, and “hours won.” The fuelband encourages you to win the hour by encouraging you to move more every hour. The SE version also has a “session” feature which attempts to address the issue where physical activities are demanding but might not register a lot of motion. Nike doesn’t have as many apps that links up with the Fuelband as the Fitbit. You can use Facebook to search for your friends that are also on Nike, albeit a bit buggy at times in my experience. For those who want to use the mobile app, it is still iOS only. I actually have been wearing the Nike Fuelband since purchasing it September 9, 2012. I am wearing the 3rd Fuelband since I first purchased it. The first ran into issues with the LED display around 9/18/2013, right after the one-year warranty gave out but Nike’s customer service was super cool and replaced it for me. Nike actually also has a grace period after the 1-year warranty, which is a nice touch. The one I am currently wearing now is a replacement of the second one, which died in May (due to a battery issue) and the company gave me the new SE version as replacement since they don’t have the “ice” band available anymore. When it comes to customer service, Nike wins over Fitbit hands down. They have phone support and you will talk to some of the nicest people on the planet (good job Nike HR). Dealing with Nike is a breeze compared to the email back and forth that I had with Fitbit. I just think that having phone support actually allows you to resolve things more quickly. I decided to get a Garmin Vivofit after having numerous issues with Fitbit over the battery issue. When Fitbit asked me to send in the defective unit the second time around, I decided I wanted to check out something different. What attracted me to the Garmin Vivofit is that there is no recharging — the battery will last a whole year. At the end of the your all you need to do is to replace the coin batteries, which costs $5 for a pack of 5 on Amazon.com. Garmin is also the only fitness tracker that currently incorporates heart rate monitoring to track calories and it also has the best water resistance (up to 50 meters, which means you can swim in shallow waters with it). Garmin is truly a fitness-oriented tracker and the tracker definitely reflects that. The display is simple and doesn’t have backlite so unlike the Nike Fuelband, you will not be able to see your stats in the dark, but that is not too big an issue for me, especially since you can’t even read the status on the Fitbit Flex, by comparison. The website for Garmin is good, though there is a bit of a learning curve and not quite as intuitive as Fitbit. Supposedly Garmin can sync with Fitbit, using the FitDataSync app, but if you read the FAQ it states “Note to Vivofit usersFitDataSync imports activities from Garmin to FitBit. Since Vivofit collects a lot of health data, this data will not be imported to FitBit. Only activities that are displayed on “Activities” page in Garmin. All other data, including steps count, calories, etc will not be imported to FitBit.” So really that FitDataSync is really for those who wear the Garmin sports watches that ran runs and such rather than the Vivofit user. The Garmin Connect does, however, sync with MyFitnessPal, which does serve my purpose well enough. As for the social portion, well, it is not as easy to use. You have to type in specific names in order to find anyone in the “connections” area in order to link up with them. I obviously don’t know any Garmin user , at least not ones that I can find. Perhaps one day Garmin will do like Fitbit and Nike and use a social network like Facebook to make this task easier. I find the Garmin band easy to wear and use. I like that it functions like a watch and gives me time and date, in additional to the calories, steps, and heart rate information. For someone who finds heart rate information important in their workout, Garmin is definitely more satisfying than Nike Fuelabnd or Fitbit. However, Garmin does not have as many API partners doesn’t use any social networks to find friends, so if that is important to you, then Garmin will be a bit disappointing compared to Nike and Fitbit. However, if you are a data geek like me, you will appreciate that you can export quite a bit of data from Garmin. For those more spec-oriented, here’s a comparison chart I pulled using the best reviewer that I have come across for all Fitness-related gadgets, DCRainmaker, who writes the most extensive review of just about every single product relating to health and fitness! I will probably continue to wear my many fitness trackers for a while, and I will update this blog if there is anything new. Do you have any experience with any fitness trackers you would like to share? I would love to see your comments below!